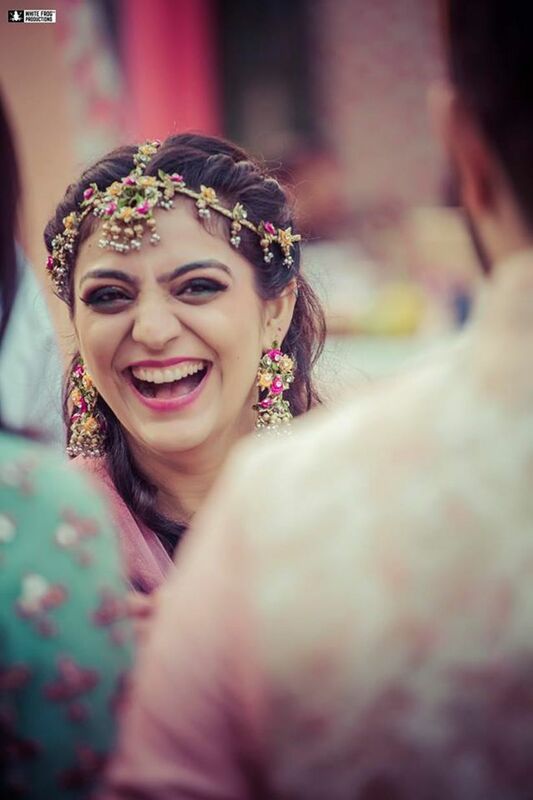 Choosing Maang Tikka and Matha Patti Styles That You Can Flaunt in Full Flair on Your Big Day | Wedding Tips ARE YOU A VENDOR? 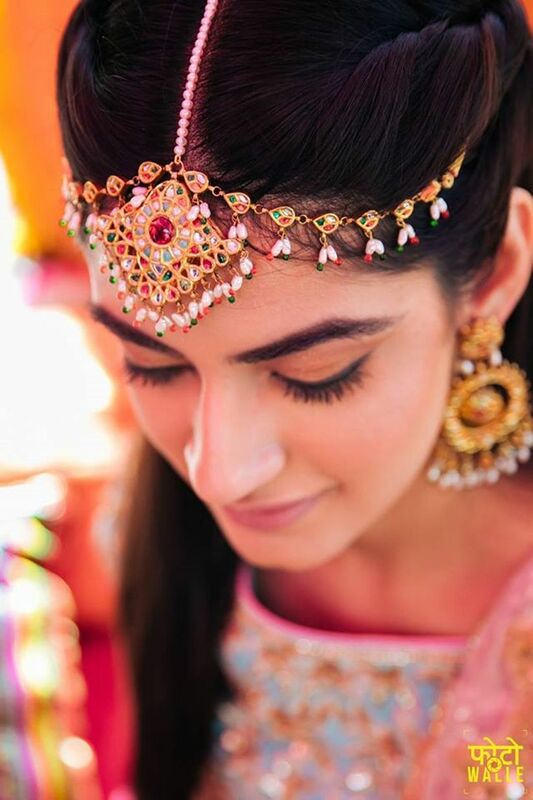 Make a style statement with your Maang Tikka and Matha Patti which is a beautiful part of bridal jewellery that is quintessentially traditional, but still a major bridal trend. When the Mega Bollywood bride, Anushka Sharma, got married, she set bridal fashion goals for all soon-to-be-married women. While everything she wore was spectacular, the intricate matha patti she sported was one of the most striking features that truly set her apart. There is something very charming and elegant about a maang tikka, however simple or elaborate it may be. Making a bridal fashion statement is all about curating the perfect look that brings together numerous individual statement pieces. 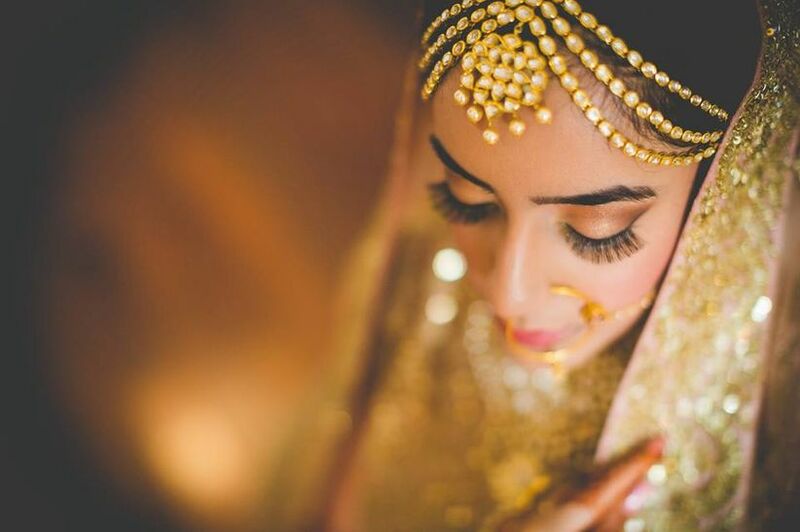 When it comes to creating a stunning bridal look, every piece of clothing and jewellery you adorn must be able to make its own significant impact. 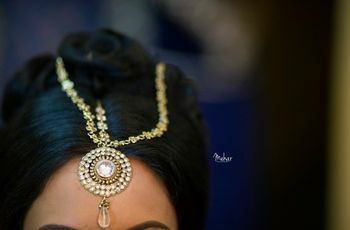 The maang tikka has become one such statement bridal piece of jewellery that is taking the bridal fashion world by a storm. 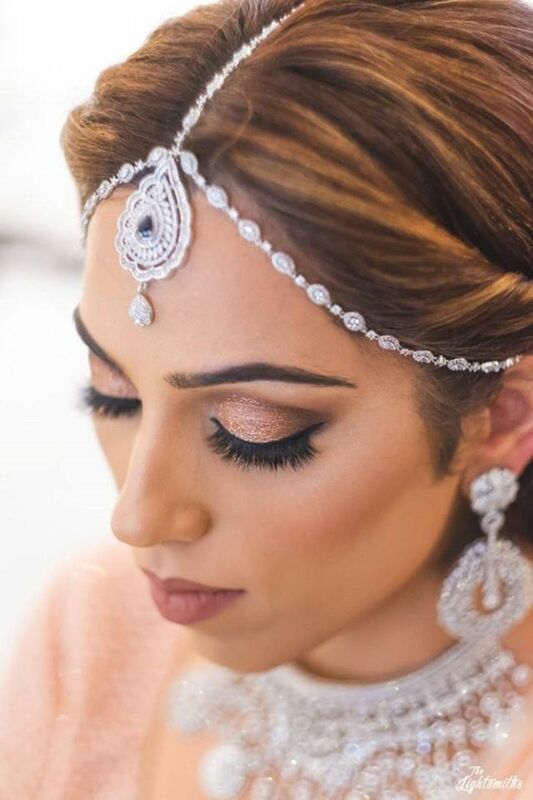 Jadau and pearl bridal jewellery sets are very popular amongst brides who want the perfect balance between traditional and trendy. Thus, it comes as no surprise that Jadau and pearl maang tikkas are a hot favourite too. Choose the maang tikka size and shape according to that of your forehead. This will help you ensure that your pretty face is not overshadowed by a jewellery item. The pearls delicately hang through the forehead gently framing the face. 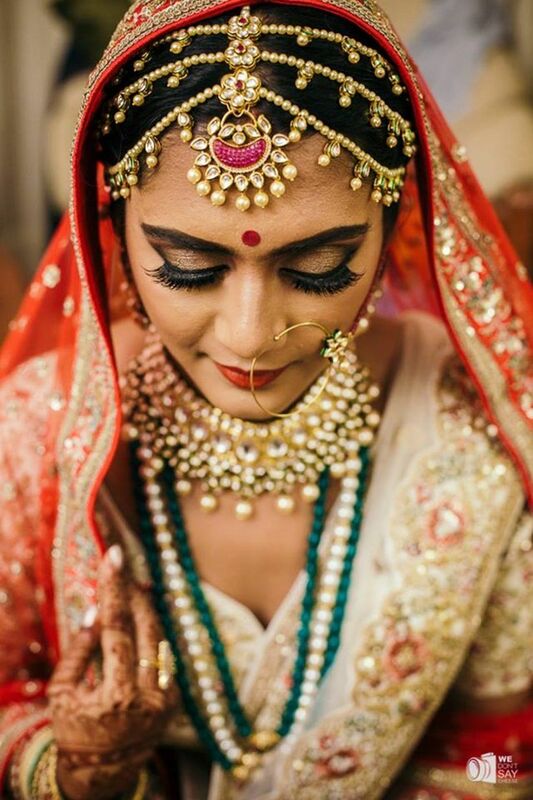 You can choose classic white pearls or coloured beads that complement your bridal wear. 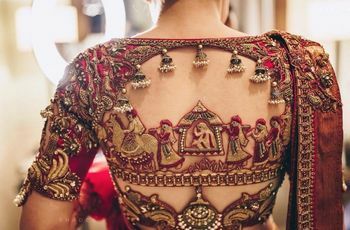 A layered matha patti such as this one will hide an uneven hairline and keep a check on those unruly baby hair on your forehead. The number of matha patti chains can vary according to your heart's desire. Just ensure that they look right when coupled with your hairstyle. You can also have a variation with layered matha pattis to make your maang tikka look more prominent. With a matha patti like this one here, who needs any hair accessories! 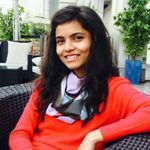 Such a design will also give you the leeway to keep your bridal dupatta a little lower on the head making it more comfortable to carry. A maang tikka doesn't always need to be held with a plain chain. It can also be embellished in a similar fashion with flower shaped design being the link. The hangings on the maang tikka are matched all throughout the matha patti giving an ethereal and royal look. Opt for something similar with a heavy lehenga design. Why not go the traditional way for your maang tikka and choose a Rajasthani Borla! It can be embellished with precious stones, pearls, Kundan lining with matha patti that trails all the way down. You can rarely go wrong with a traditional choice like this one. For brides who want a hint of Padmavati factor to their personal royal look can surely opt of it. Style and tradition - all mixed in one. If you're wearing diamond jewellery set in white gold or platinum, you need a complementing maang tikka to go with it. 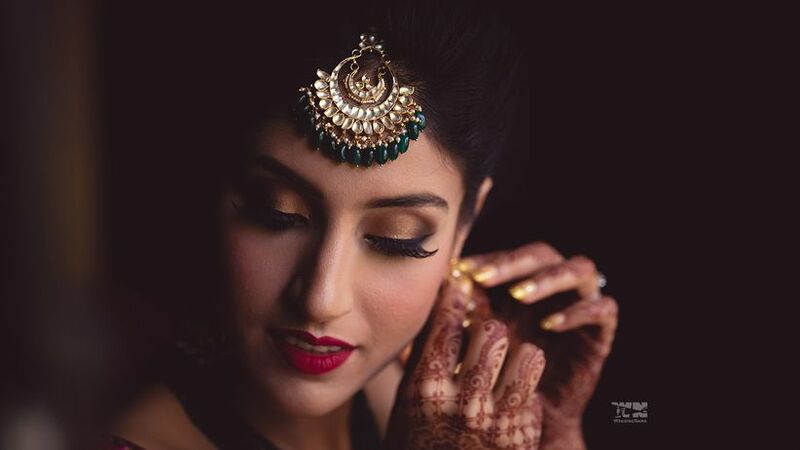 A prominent but elegant maang tikka encrusted with a precious gemstone will amplify the charm of your bridal look while the delicate strings around it hold it in place. If you want to keep it trendy and stylish you can choose something like a geometric design rather than the quintessential rounds, paisleys and floral. 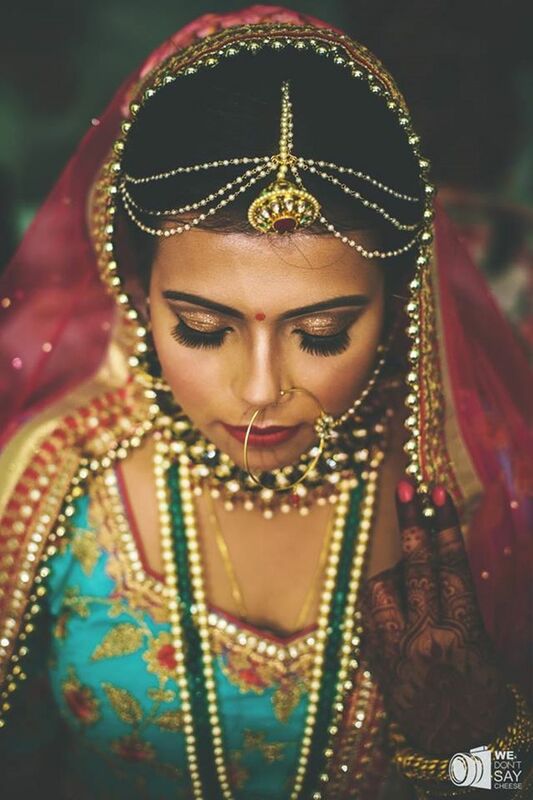 The design this bride is flaunting is unconventional yet striking. The drop at the end of this maang tikka siezes the show with its elegance. The twisted hair locks on the sides make it even more prominent. Such a delicate item would go perfectly well with a pastel shade lehenga. Imagine the Sarowsky work of your blush pink lehenga and shine of the twinkling diamonds captured in a single photo complementing each other. Doesn't just the thought look pretty to you? A maang tikka is something that you may not wear as often as other pieces of jewellery. So, to shine on your Mehndi or Sangeet function, opt for a Meenakari maang tikka. It is light-weight as compared to other jewellery styles and loaded with style to make your look uber chic. The uncommon shape of this particular maang tikka gives it a quirky appeal. And the hanging pearls mimic the trending tassels making you ace the fashion game. Since it is light jewellery, you can easily wear it for parties later on like an office Diwali party or Karwa Chauth. Perfect for a Mehndi or Sangeet ceremony, a Gota jewellery maang tikka can work wonders with the right attire. On such ceremonies, where the mood is light and the outfits are colourful, this is exactly the kind of maang tikka and matha patti you need. Imagine the look on an Indo-western dress for Mehndi, simply picture-perfect. You can easily dance away in this light-weight jewellery and even reuse at a friend's bridal shower or Bohemian themed party. Skip the matha patti and pair your maang tikka with a Passa. Sure, the balancing act with matha patti and maang tikka is simpler but the style factor definitely goes up a notch with a Passa as you can see in the picture. 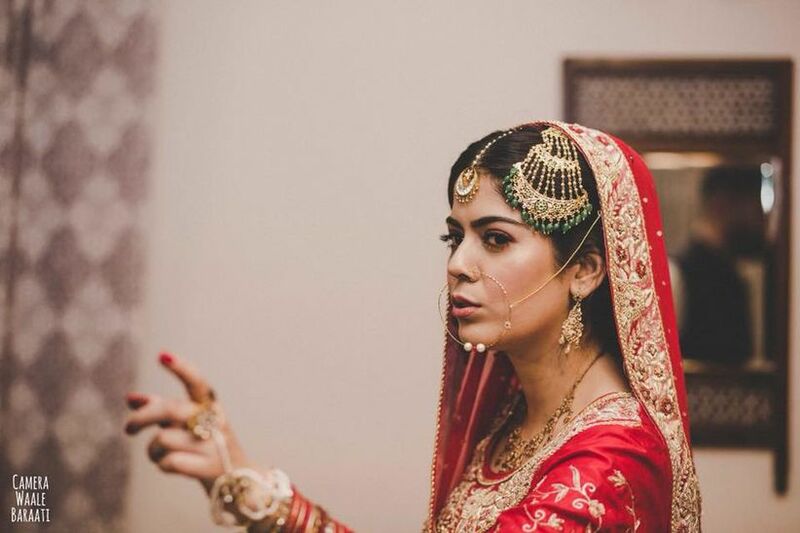 Become the snazzy bride who wears a maang tikka with a Passa. You can even pair the two in complementing gemstones and make a fashion statement of your own. 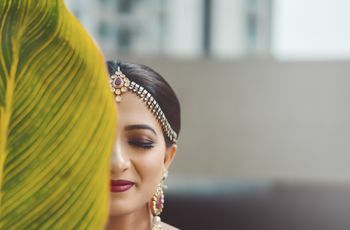 When it comes to finding the right fit for a bridal maang tikka, there are certain elements you should keep in mind while selecting one. The maang tikka should complement your face shape. If you have a round face, don't choose a maang tikka which is large in size and long in length, as it will cover a substantial amount of your forehead. It would garner more attention than your face which should not be the case. Go for a balanced look instead. The embellishments on the maang tikka can also be used to create a balancing act between your attire and your jewellery. 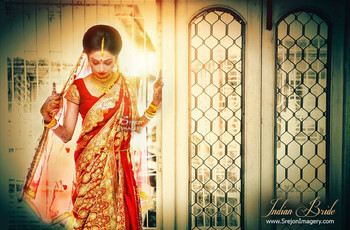 The gemstones encrusted and hanging from it can be chosen of the same colour as your bridal lehenga. The metal and colour of your maang tikka, yes, that's important too. It will all depend on your skin undertone. If you have a cool undertone, silver, white gold or platinum maang tikka will suit you. 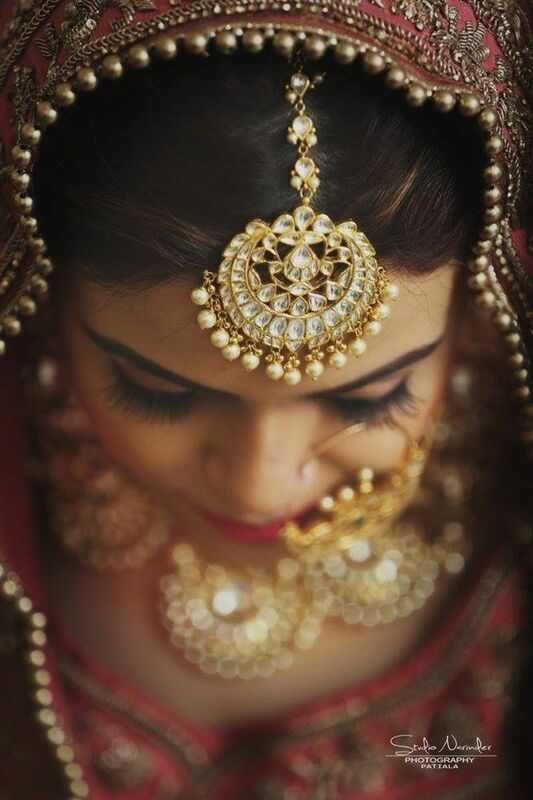 Brides with a warm undertone can flaunt a gold mang tikka with full flair. Mix undertoned brides don't have to worry about either of these things and sport any kind of maang tikka they like. Choose a style that suits your face shape and merges well with your jewellery set. You can even opt for a design that does not have matha patti but only has maang tikka. Always try it on before buying and ensure that the material underneath does not cause you any allergies. Tell your hairstylist to tightly secure it so that it doesn't run away while you're busy dancing. So what’s your bridal maang tikka pick? Will you go big and bold or keep it delicate and simple?